★The engine is equipped with Gear Box, Ignition Coil, Carburetor, and Air Filter. 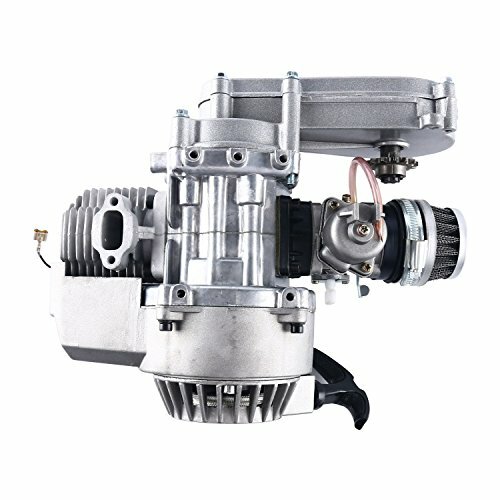 ★49cc 2 stroke Engine w/Automatic Transmission for SSR SX50, QG50, QG50X and Pocket Mini ATVs Scooters. ★Compatible Models: Such as Blade, Kinroad, Roketa, KPX, SUNL, Aimex, Alpha sports, BMS, BMX, Cool Sports, Baja, JCL, Taotao, Peace, JM Star, Jonway, Kazuma, KMD, Kymco, Lance, Linhai, NST, Redcat, Roketa, Tank, X-Treme, Yamati, Coolster, Terminator, Lynx etc. ★Aluminum Cylinder Head and Iron Cylinder Body: Improves the heat dissipation capability, cuts the weight and increases the torque of the engine. ★Built-in Reverse: Makes it easier to control your bike for moving forward and backward via operating the gear change pedal. Great features include user-friendly operation, high reliability, convenient installation and maintenance, etc. ★High-flow Oil Pump: Reduces the wear of friction pairs and prolongs the engine life. ★Lubricating Oil Strainer: Helps removing solid contamination from lubricating oil, largely reducing the wear of friction pairs and prolonging the engine service life. ★PLEASE NOTE: Please measure the physical size to be sure you get the correct one. 49cc 2 stroke Engine w/Automatic Transmission for SSR SX50, QG50, QG50X and Pocket Mini ATVs Scooters. Specification:49cc single cylinder, air-cooled, 2-stroke Use T8F Chain. The engine is equipped with Gear Box, Ignition Coil, Carburetor, and Air Filter. Compatible Models: Such as Blade, Kinroad, Roketa, KPX, SUNL, Aimex, Alpha sports, BMS, BMX, Cool Sports, Baja, JCL, Taotao, Peace, JM Star, Jonway, Kazuma, KMD, Kymco, Lance, Linhai, NST, Redcat, Roketa, Tank, X-Treme, Yamati, Coolster, Terminator, Lynx etc. If you have any questions about this product by Yaegoo, contact us by completing and submitting the form below. If you are looking for a specif part number, please include it with your message.